1. Combine the milk, salt and pepper in a large, narrow stockpot (not kettle or braising pan). Heat to 180 degrees F.
2. Slowly add the grits to the hot milk while stirring. Bring just to a boil.Stir constantly to avoid scorching. 4. Once the grits are dissolved, lower the heat to a simmer and cook for 20 -30 min or until grits are tender and fully cooked. 5. Stir occasionally to maintain a smooth, creamy texture. 6. Stir in the cream and butter. 7. Cook for another 2-3 min. until the grits are tinder. 8. Fold the grated cheese into the grits. 10. Check yield, and remove from heat.If needed immediately, transfer to a 1/6 or 1/3 pan. 11. Otherwise, chub into 1/2 gallon chubs, label, daye, initial, and place in an ice bath immediately to prevent continued cooking. 12. Once cooled to 40 degrees, portion the grits into 2#8 Scoop microlight contaiers and store refrigerated. SHELF LIFE: 5 days Refrigerated . Hot on line - 2 hours. Texture: Creamy through the vast majority with a tiny bit of grit in the very center of each piece. 1. Melt the butter in a pre heated saute skillet over high heat. Add the andouille, pepper portion, seasoning and green onions. Saute for approx. 1 minute, until the sausage and peppers have begun to only slightly color. 2. Add the shrimp, clam juice, lea & perrins, jambalaya topping and bring to a boil. Cook just until the shrimp are heated throughout. The sauce should only slightly reduce. 3. Once heated, add the butter to the skillet and shake vigorously until the butter has been incorporated. 4. Meanwhile, heat the creamy grits in the microwave for 1 minute, being sure to stir the grits half way through the heating. Bringing a Taste of the Big Easy to the Big Apple! 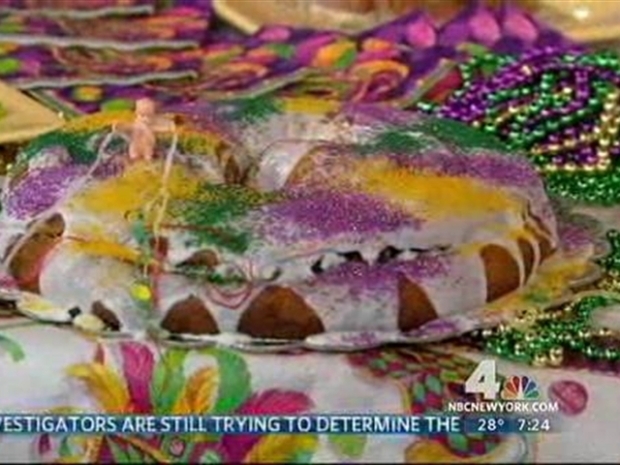 Chef Chuck Wheeler of Copeland?s Restaurant brings Mardi Gras to you with a few of New Orleans? most popular food. 5. Place one #8 scoop of the heated grits in the center of the pasta bowl. 6. Pour the heated shrimp sauce on top of the grits, evenly spreading the shrimp and andouille on and around the grits. 7. 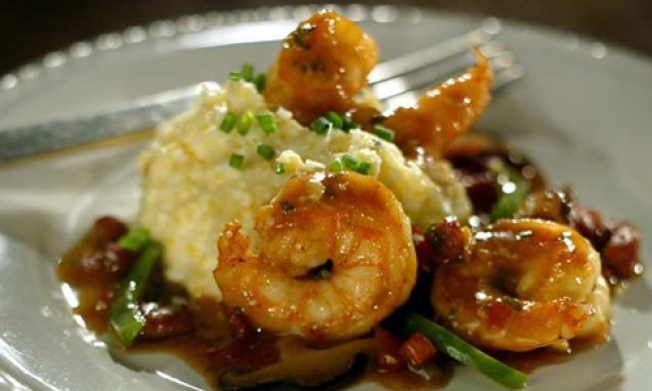 Place the second scoop of grits on top of the center of the shrimp and andouille sauce. 8. Sprinkle with approx. 1/2 tsp. of parsley and serve immediately. 1. In a skillet, bring the heavy cream to a boil and reduce by half. 2. Add Alfredo sauce and whisk in until smooth. 4. Distribute Velvet Crawfish evenly across the bread. 5. Pour mixture over crawfish and spinach mix. 6. Sprinkle Monterey Jack cheese over Alfredo sauce. 7. Place on ½ sheet pan lined with deli paper and place in the cooler. 1. Place pork medallions in a dry pan lined with a clean sheet of deli paper. 2. Evenly sprinkle with 1 tsp. cajun duck seasoning over medallions. 3. Turn medallions over & sprinkle with remaining 1 tsp. of cajun duck seasoning. 4. Ladle the clarified butter onto the blackening grill. 5. Place seasoned medallions on the blackening grill. Cook until the spices are blackened, about 2.5 minutes. 6. Flip meat over & cook until spices are blackened & meat doneness reaches medium, about 2.5 minutes. 7. Ladle La Boucherie Sauce in sauté pan to warm. Do not boil or reduce. 8. Meanwhile, place the Angel Hair pasta in boiling water to warm. 9. Drain pasta & place in small metal bowl with the Whipped Garlic Butter. Toss with a spatula until pasta is coated. Using a pasta fork, mound the pasta at 12 o'clock on a 15" oval platter. 10. Pour the sauce around the pasta (but not on the pasta) onto the plate. 11. Place medallions onto sauce around the pasta. 12. Garnish the plate rim with the Minced Parsley. Place a biscuit at 11 o'clock. 1. Melt the butter in a large rondo and the diced sausage. 2. Cook for approx 5 minutes over medium high heat until the sausage has rendered out its fat and the butter is foamy. 3. Add the diced chicken, house seasoning, paprika, and salt and cayenne. 4. Cook for 5 minutes more until the chicken is completely cooked and browned. 5. Add 1 Cup of chicken stock to the rondo and stir with a cooking spoon to release all of the browned pieces from the pot. 6. Transfer the browned contents of the rondo to a steam kettle and add the onions, celery, bell peppers, garlic, and green onions. 7. Cook for 5 minutes until the vegetables have completely softened and begun to "cook down". 8. Add the chicken stock and bring to a boil. 9. Once boiling, add the gumbo crabs, okra, chicken base, & fish base and bring back to a boil. 10. Add the dark roux while wisking to incorporate. 11. Place the water and flour in a mixing bowl and whisk to make a slurry. Add the slurry to the gumbo while whisking. 12. Bring to a boil then reduce the heat to a simmer. 13. Simmer for 1 hour, stirring occasionally. 14. Remove from the heat, check the yield, and chub into 1/2 gallon increments. label, date, and initial each chub. 15. Place the chubs in an ice bath to cool to 40 degrees. 16. Once cooled, remove from the ice bath and store refrigerated. 17. Bring a pot of water to a boil. 18. Add the chub of gumbo base to the pot to heat to 140 degrees. Do not open the gumbo into a pot and heat, the resulting soup will be too salty. 19. Place the shrimp and oysters in a skillet and heat until cooked throughout. 20. Open the heated gumbo into a 1/3 pan and add the cooked shrimp and oysters. 21. Place the heated soup in a heat well and hold hot for 1 shift. Charleston “Chuck” Wheeler currently serves as the Director of Culinary Operations for the Al Copeland Investments, which owns and operates a wide variety of restaurants in the New Orleans region, including: Copeland’s Famous New Orleans Restaurant & Bar, Copeland’s Cheesecake Bistro and Sweet Fire & Ice.